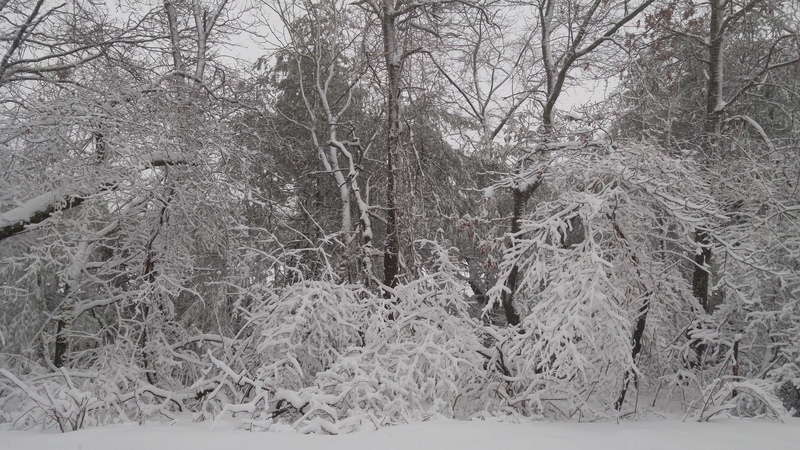 Snow weighing down the trees in Suffolk County on February 5th, 2016. Photo sent in by LongIsland.com Reader Remie S.
For Long Islanders hoping that Winter Storm Jonas was going to be the last of the snow for the 2016 Winter season on the Island, waking up this morning and looking outside was a big surprise! Starting off as rain last night, which then transitioned over to snow, powder fresh snow has been falling and coating Long Island streets since last night and continuing on into today. On account of this, many local public schools, private schools, colleges and other institutes and institutions came to the decision to schedule delayed openings, or simply close for the entirety of the day. Whether today's snow day means a relaxing day inside in the warmth for you, or an exhilarating day outdoors making snow forts and starting snowball fights, be sure to stay safe and practice proper winter safety! As schools reported to us on February 5th, 2016. Not an official state record.